The amount of methane leaking from natural gas emissions is far higher than previously estimated, a new study shows, more evidence, as one expert says, that urgent action must be taken to reduce these greenhouse gas emissions. The findings, based on a review of over 200 previous studies, was published Friday in the journal Science. Methane is about 30 times more potent of a greenhouse gas than carbon dioxide, so while President Obama has championed natural gas as a "bridge fuel" to address global warming, the climate implications of this "leaky" industry deserve scrutiny. "People who go out and actually measure methane pretty consistently find more emissions than we expect," said lead author of the study Adam Brandt, an assistant professor of energy resources engineering at Stanford University. "Atmospheric tests covering the entire country indicate emissions around 50 percent more than EPA estimates," said Brandt. "And that's a moderate estimate." The amount could be as high as 75 percent greater, the researchers found. Part of the discrepancy in the federal government's estimates of methane and those presented in the studies is because the EPA took measurements from sites in which companies participated voluntarily. The EPA also does not measure methane emissions from natural sites like wetlands. Atmospheric studies, in contrast, are able to be more encompassing. Given the current level of methane leaks from the industry, switching trucks and buses from running on diesel to natural gas could actually be contributing to global warming, the study found. "While studies like this are helpful, we need to act now to curb methane emissions." —Sarah Uhl, Clean Air Task Force"Fueling trucks and buses with natural gas may help local air quality and reduce oil imports, but it is not likely to reduce greenhouse gas emissions. Even running passenger cars on natural gas instead of gasoline is probably on the borderline in terms of climate," Brandt said. In order for that to be a greenhouse gas-beneficial switch of fuels, these methane leaks must be curbed, the study says. Still, generating electricity from gas instead of coal is better for climate change, the researchers note. "The study by Brandt et al. adds to a growing body of evidence suggesting that EPA's estimates of methane emissions from the oil and gas sector are too low," Sarah Uhl, Senior Project Director at the Clean Air Task Force, a Boston-based public health and environment advocacy group, said in a statement sent to Common Dreams. "Fortunately, it costs little, or even pays, to stop these methane leaks and doing so is critical to meeting the President's publicly-stated pledge to reduce greenhouse gas emissions by 17% by 2020. Therefore, we are urging this Administration to tightly regulate methane emissions from the oil and gas industry. 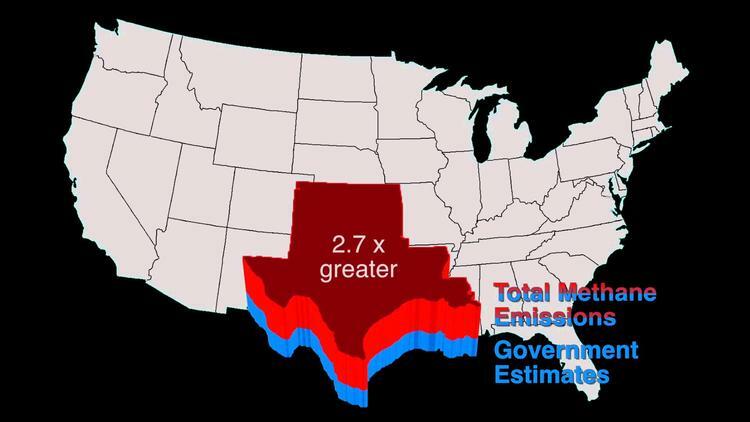 While studies like this are helpful, we need to act now to curb methane emissions," Uhl stated.